In a microwave-safe bowl, combine the milk chocolate chips and shortening. Microwave, uncovered, at 50% power for 1 to 1-1/2 minutes or until chips are melted, stirring every 30 seconds. Cool slightly. Place a small amount of chocolate mixture on top of six marshmallows. Let stand for 1 hour or until set. Warm the chocolate mixture. For the penguin bodies, carefully dip sides of the marshmallows in chocolate mixture so three-fourths of the marshmallows are covered, leaving about 3/4-in. vertical strip of white. Let stand on waxed paper until set, about 1 hour. For penguin heads, cut Tootsie Rolls into two-piece sections. Place on a microwave-safe plate; microwave at 10% power for 10-15 seconds or until slightly warmed. Carefully roll each into a ball. With a toothpick, position chocolate chips for eyes. For beaks, cut off yellow end of six candy corn pieces; flatten remaining candy slightly. Press gently into chocolate balls. Reheat chocolate mixture. Dab a small amount onto bottom of each ball; position on penguin bodies. Let stand until set, about 45 minutes. Separate cream-filled cookies; remove and discard cream filling. For wings, cut six cookies in half. Rewarm the chocolate mixture. Spread a small amount on each cookie half; attach to penguins with cut edge facing forward. For bases, attach penguins to remaining cookies using melted chocolate. For feet, remove white ends of remaining candy corn pieces and discard; flatten candy. Attach two candies to each cookie base. Let stand for 45 minutes or until set. Make this sweet and silly penguin, and lots of friends and relatives for it if you have enough pipe cleaners. 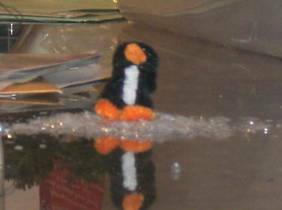 You can sprinkle some white glitter on the table to display them and stage a "penguin pageant." To make a penguin, take an orange pipe cleaner and bend it in half. Curl the two bottom tips into tight spirals for "feet." Bend them flat, so that your penguin will stand upright. Next, take the black pipe cleaner, and wrap it around so that enough of the orange is showing at the top to bend forward into a beak. Wrap and coil the black pipe cleaner around to the feet, tucking in the end. Arrange the beak and make sure the penguin still stands steadily on its feet. Last, but not least, cut a snip of a white pipe cleaner, bend both tips at the very ends so that it forms a "C" shape, and then push the two curved ends of the white section into the black "chest area." The wire on the end of the white section should nestle inside the black coiled pipe cleaner, and stay put. If you have tiny googly eyes, you can glue them on for added fun. You hardly ever see penguins by themselves. So make lots of penguins - to make a "colony." That's the proper word for a bunch of penguins!